I had some new fun in the garden yesterday. New, liberating fun. Scary kind of fun. I used my new chipper shredder for the first time. 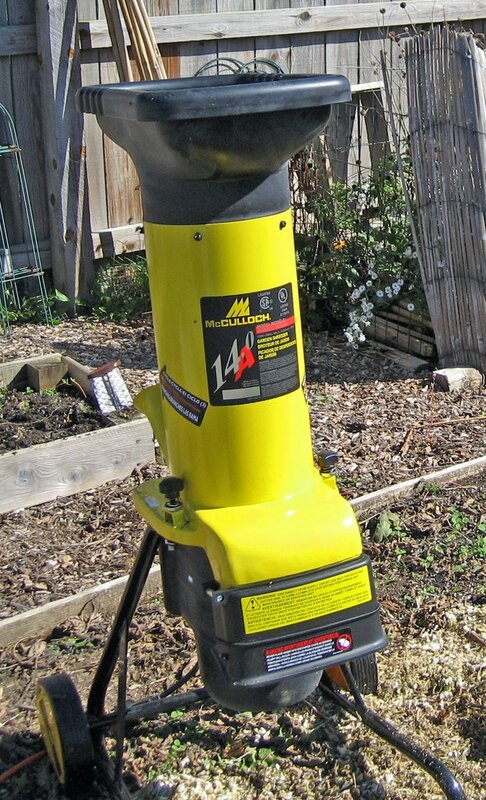 Yes, that’s right, I have a new chipper shredder, the McCullough Electric Chipper Shredder. I wrote about it awhile back, so if you have been reading my blog, you should not be surprised that I got it. I had been reading about it, seeing it in catalogs, and wanting it for some time. Then I found it online at Amazon/Target last month for quite a bit less than I had seen it anyplace else online, so I took that as a sign that it was meant to be for me and I ordered it up. The UPS driver brought it to me about three days later. I was actually home, and she rang the bell and offered to put it in my garage, since it was a big box. Then, unfortunately, I got very busy again and didn’t have a chance to unpack it and put it together until last Saturday. I was able to put it together with minimal tools by myself, and just had one moment where I had to study it a bit to figure out how the motor/blade part of it should go on the stand part. Otherwise, as far as putting things together, I’d say it wasn’t too bad. Not the easiest, but not the hardest thing to put together. Then this Saturday, a glorious, cool, perfect blue sky kind of day, I wheeled it out to the garden and tried it out. First, I ran some old, dried up zinnia plants through it. It was actually not too loud, though I did use ear plugs, just because it is loud then quiet, loud then quiet. But overall the noise level was not too bad and it was certainly not nearly as loud as my old gas powered chipper. It shredded the zinnia plants just fine. So I moved on to the giant sunflowers. It ate them up like a hungry bear coming out of hibernation eats its first meal. Moving on, we (me and the chipper shredder) tried out the big pile of corn stalks I’d chopped down a month or so ago. The dry stalks were no problem. 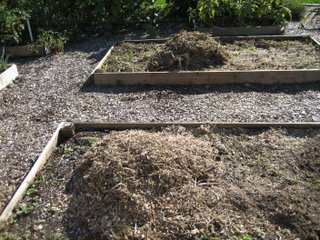 However, the stalks near the bottom of the pile were wet and beginning to rot. Those caused a few problems, but the hopper is easy to remove and clear out and I was able to at least shred all of the stalks. Then we finished up with another pile of zinnias and some dry stuff I took out of the compost bin. The chipper shredder is a keeper and is now one of my top gardening tools. It will change the way I do fall clean up and my whole approach to the end of the season. No longer will I be digging long trenches in my raised beds and burying the garden refuse. No longer will I feel the shame of putting plant material in trash bags to go to the city incinerator/dump. No longer will I have full compost bins, with large, bulky plant material taking forever to decay. Now I will be happily shredding everything and watching it quickly compost into ‘black gold’ to be put back into the very garden beds that provided the plant material that made it all possible! I can’t wait to continue the garden clean up so I can gather more material to shred. Told you I had liberating, scary kind of fun yesterday! Here are the two piles of mulch I ended up with yesterday. Aren't they pretty? I want one of those too! !